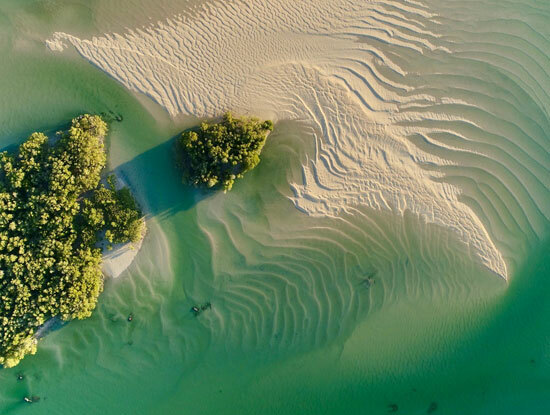 The Karajarri Tourism Zone is a beautiful coastal part of Karajarri country, which tourists are welcome to visit and enjoy, provided that they have purchased a valid Visitor Pass. 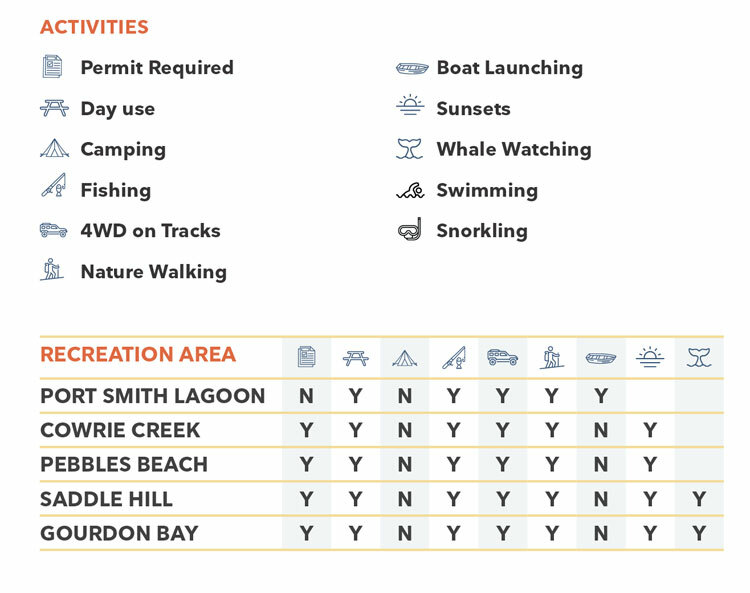 Activities permitted in the Tourism Zone include nature walking, swimming/snorkelling, whale watching, fishing, four-wheel driving and boating. 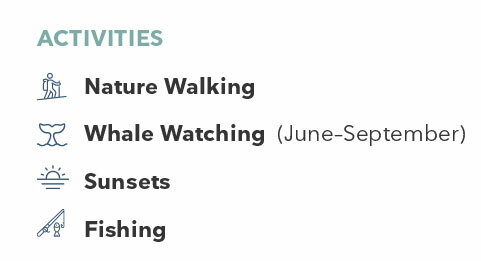 Please check which activities are permitted at each location. Historically, the picturesque Gourdon Bay area was used by the crews of pearling fleets, who had established camps at Port Smith (Punturrpunturr). Pearling luggers would replenish their supplies of water from the permanent well in Gourdon Bay, and load up with firewood. 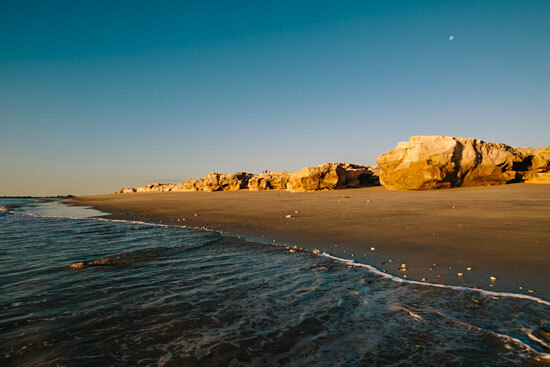 The area between Pirtingapa (False Cape Bossut) and Mirntanymartaji (Gourdon Bay) is a major fishing ground for the Karajarri people and particularly for the Najanaja families. 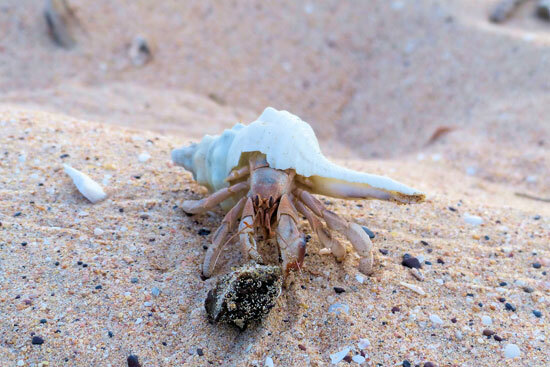 A range of marine ecosystems, including reefs, tidal creeks and sandy beaches, all provide a varied seafood diet for the Karajarri people. 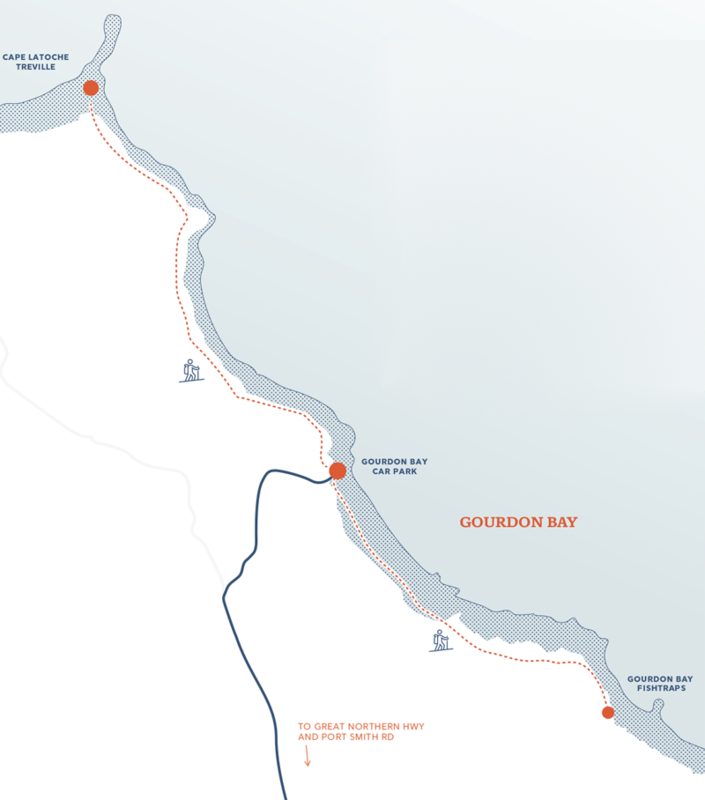 Gourdon Bay is also recognised as a sanctuary for Dugong, Dolphins, Green Turtles and migrating Humpback Whales. 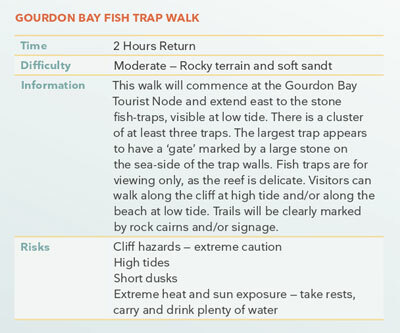 There are two fantastic nature walks that begin at the Gourdon Bay carpark — the Gourdon Bay Fish Trap Walk & Cape Latouche Treville. Both walks provide scenic views of the bay as well as rich ecological and cultural history. The Saddle Hill Area between Gourdon Bay and Port Smith is a ‘big fishing place’ for all Karajarri people, especially for the Najanaja families, who come from this area. There is ‘plenty of reef fish, kuckles, all sorts of shellfish, and Dugong in the bay’. Along the edges of the bay in the pindan cliffs and sand dunes are extensive shell middens. Particularly significant is the quantity of large pearlshell (riji). Saddle Hill is a large red sandy hill on the south-western edge of Gourdon Bay. Local Karajarri people come here for camping, fishing and shelling. They used to trade pearlshell along the traditional wunan routes and sell it to pearlers and beachcombers. Port Smith Lagoon and its tidal creeks were one of the main ‘lay-up’ areas, where pearling luggers used to come in for supplies and to make repairs. A Pulany (water serpent) is believed to be resting in the entrance of the lagoon, which ‘can pull down boats and men’. It is said to have travelled underground to Jipngurru from the inland Yawuru site, Tipinkujarra. The creeks that flow into the lagoon have many well-known fishing places, with plenty of large parrala or ‘resting waters’. These are excellent fishing pools, left as the tide recedes, where ‘you get plenty of bluebone and snapper and turtle’. The muddy creeks are renowned for their supply of crab and stingray. A multitude of small depressions, visible at low tide, are left in mud by the stingray, which dig into the seabed for food. The mangroves provide minyal, a particular kind of witchetty grub, and kunturung, a fruit from one species of mangrove. Port Smith Lagoon is a great place for walking and fishing (from a boat and from the beach) and admiring the special mangrove system. Take care when launching boats to avoid driving over young mangroves. Please note, a Visitor Pass is not required if you are just visiting the Port Smith Lagoon. 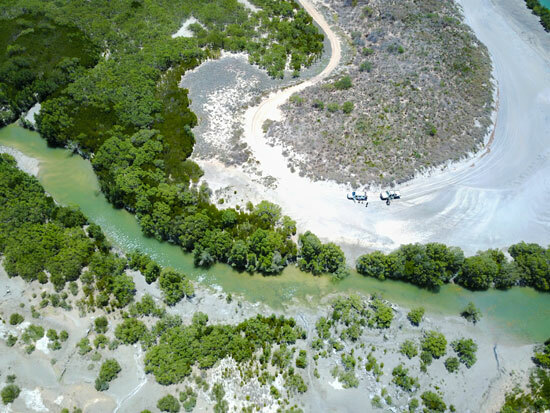 By first dropping your tyre pressure, you can have a small 4wd adventure and drive to the mouth of Port Smith Lagoon. Here you can swim, fish and admire the beauty of the lagoon from the mouth. Please be aware of big tides and ensure you take full recovery gear as the sand is very soft on this track. Please also stick to the tracks. Travellers are responsible for their own safety. Cowrie Creek is the southernmost point accessible to tourists. 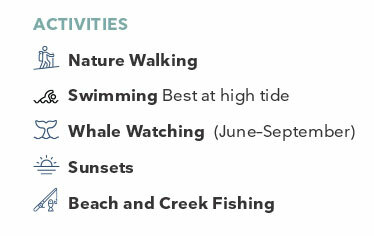 Here people can drive right up to the beach and enjoy the creek area as well as the open ocean. This place is special for its reef, which lies close to the beach. 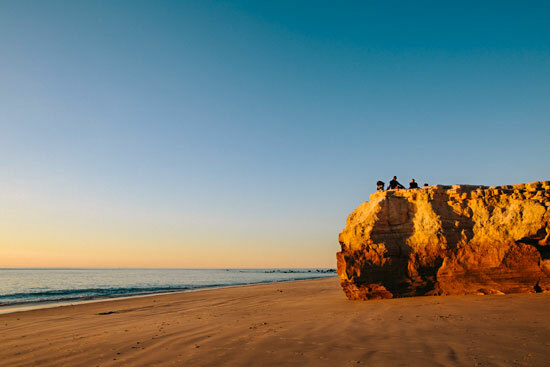 Take off your shoes and walk the remote beach to experience country. On the way to Milarnyarri from Port Smith you will drive past two significant places where both Dreamtime and colonial era events took place: the Danger Seed story and the Gourdon Bay/La Grange Massacre. Holders of a valid Visitor Pass have access to all five locations during their visit. Please note, all other areas are off limits as they may be ecologically sensitive areas, burial and law grounds or areas used by the community. Please respect these restrictions and the maps and signs on the roads. If you are unsure, please ask a Traditional Owner or Ranger, who will advise you. A four-wheel drive vehicle is required to access all locations within the Tourism Zone except the Port Smith Lagoon. Please ensure your vehicle is suitable and well maintained. Check that you have spare tyres, recovery gear, compressor, jumper leads, first-aid kit and plenty of fresh water for drinking. Drop tyre pressure to 20psi before you hit the tracks. Tell someone where you’re going before you set off. Travellers are responsible for their own safety. 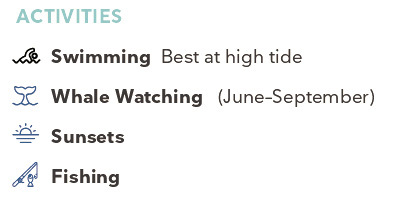 Watch out for the high tides, which can trap people, especially in cliff areas. When walking, never set off when tide is coming in. Be aware of sunset times; the sun goes down quickly in northern Australia. 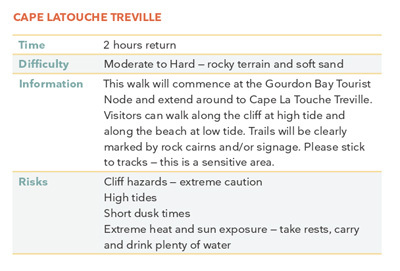 Be aware of cliffs, particularly around Gourdon Bay and Saddle Hill. We encourage people to walk on Karajarri country. Please follow all usual protocols such as letting someone know before you go, do not exceed your ability, carry water, follow signage where it exists. Where signage doesn’t exist, ensure you can get back to your vehicle easily (i.e. no bush bashing). Please carry out all rubbish. 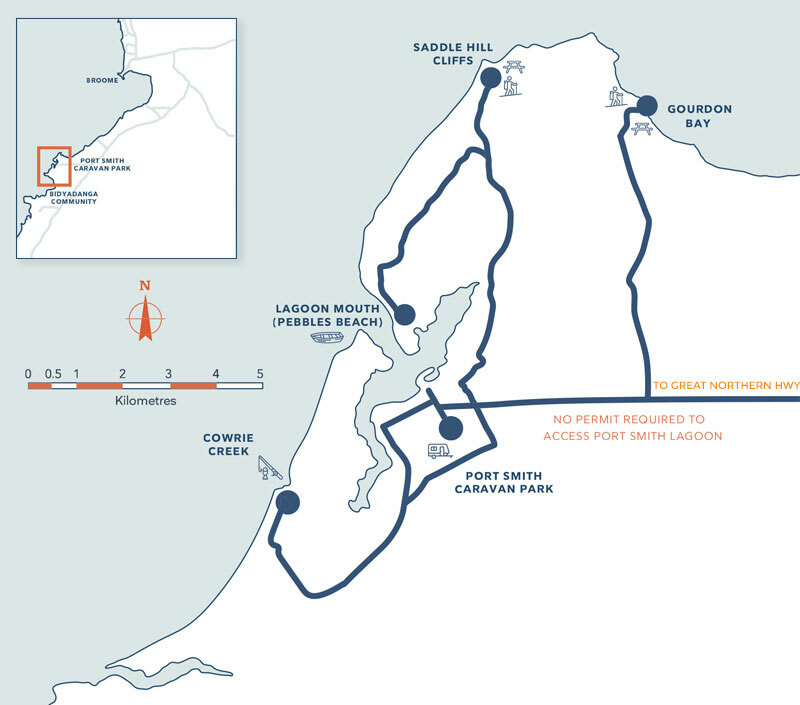 Disposal points are located on the Great Northern Highway. At this time no toilets are available on Karajarri country. When toileting out bush please bury all waste and keep well away from tracks and roads. There are no water points on Karajarri country. Be sure to bring water with you when you visit. At this stage no camping sites are available within the Karajarri Tourism Zone; however, we are working to provide camping facilities in the near future. Accommodation is available close by at the Port Smith Caravan Park. We recommend staying overnight and enjoying what Karajarri country has to offer over several days.